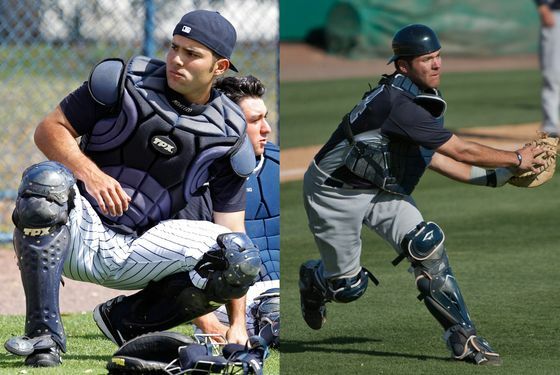 Could Jesus Montero and Austin Romine Both Make the Postseason Roster? For years — particularly in the weeks leading up to the trade deadline each summer — Yankees fans have heard about all the promising catchers working their way through the minors. Indeed, last November, Baseball America ranked catchers Jesus Montero, Gary Sanchez, and Austin Romine as the top three position players in the organization's farm system. Two weeks ago, none of the three had ever played in a major-league game. And now, two of them — Montero and Romine — have a shot at making the postseason roster. Montero, who first appeared for the Gulf Coast League Yankees in 2007, was named the organization's top prospect by Baseball America each of the last two seasons. And when the rosters expanded on September 1, he made his big-league debut at Fenway Park, serving as the designated hitter. Jorge Posada's struggles this season meant the Yankees lacked a regular DH, and so with a month left in the season, Montero would be given a chance to earn plenty of playing time. And so far, his bat has impressed. In 30 plate appearances over eight games, he's 8-for-26 with three homers and three walks. This is still a pretty small sample, of course, but that's an impressive slash line of .308/.400/.654 — good enough, one would think, to be considered for a spot on the postseason roster. Martin's injury isn't thought to be serious, but Cervelli learned yesterday that he indeed has a concussion and is out indefinitely. And so once Martin returns, the Yankees will still need a backup catcher if Cervelli isn't available for the playoffs. (Considering this isn't Cervelli's first concussion, we wouldn't count on him playing again in 2011.) Montero isn't considered a very good defensive catcher — the Yankees pulled him for Romine late in Sunday's win in Anaheim — and though he's in great shape to make the playoff roster, it's because of his bat. And so it's possible Romine could simply take the roster spot previously occupied by Cervelli, and make the roster as the backup catcher. Of course, a lot hinges on how Joe Girardi and Brian Cashman choose to assemble the postseason roster. As Mike Axisa points out over at River Avenue Blues today, there's a lot of variables in play, ranging from the number of pitchers who make the staff to whether the team wants to carry a pinch-running specialist. And it might also depend on how big a risk they're willing to take. The safest move is to let Martin start every game behind the plate, let Romine serve as his capable backup in case of an injury, and let Montero (or whoever) serve as the DH. But that could make Posada the odd man out. After all, Montero would essentially be taking away the designated hitter job that was Posada's at the beginning the season. Otherwise, this could be quite the changing-of-the-guard situation, if the veteran Posada is left off the postseason roster, and the youngsters Montero and Romine both make it.